+ free cotton bag, stamped with the “Foot” Antigym® logo to store your material. 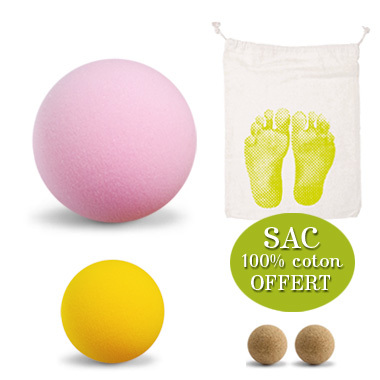 This kit 4 balls will let you perform all Antigym® movements offered in our CD and our books. We have selected these balls out of many types of foam balls with varying texture and firmness offered by several manufacturers. We could not find a manufacturer in France, but we found one in nearby Germany, so shipping will not be a concern as it might be when goods are produced off-shore. This small German firm, established in 1971, employs about 20 people and manufactures its products in an ecologically and socially responsible manner. We purchase these 3 cm diameter cork balls directly from a small manufacturer in southwest France. This company has been manufacturing artisanal cork products since 1930. We like the fact that, being made of natural cork, each ball is slightly different in density, shape and colour.